The kitchen is the most important part of the house. No matter how many living rooms and dining tables you have, when you have guests over inevitably everyone ends up gathering in the kitchen for one simple reason: that’s where all the food is! Naturally, you want your kitchen to look bright and modern. But we all know that renovating the kitchen can be extremely expensive and time-consuming. That’s where we come in — our experienced kitchen cabinet makers produce cheap and high quality flat pack kitchens in Perth, and will help you have your dream kitchen in no time. WA Kitchens specialise in providing beautifully designed kitchens, and are the experts in flat pack kitchens. No matter what the size of your kitchen and budget are, we will work with you to fully understand your needs. We guarantee that we will deliver solutions that will fulfil your requirements and give you the utmost satisfaction. All of our cabinets are produced right here in WA, so you know you’re receiving only the best with WA Kitchens. Our expertise extends beyond kitchens too, and we are able to assist with providing solutions for other areas of your house. Flat pack kitchens allow you to have your kitchen exactly the way you want it. 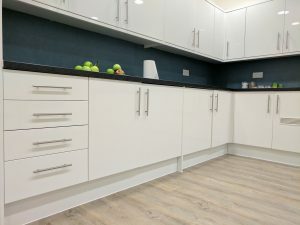 Our easy to assemble DIY cabinets allow to easily build and arrange your kitchen, and we have an extensive range of flat pack kitchen cabinets that ensure you will be able to find cabinets of the right style and size for your kitchen. They can be customised to suit your tastes. 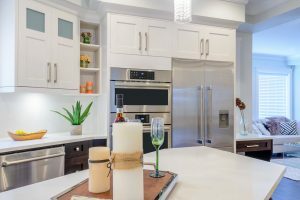 With many years of experience delivering the perfect kitchen to households all across Perth, our professional kitchen cabinet makers are guaranteed to provide you with cheap, long-lasting flat pack kitchens. Whether you’re after flat pack kitchens or kitchen installation services, WA Kitchens has all of your needs covered. For enquiries or for more information, contact us or call us on 0424786508 today. Our experts will have you sorted in no time. After getting several competitive quotes for our new build kitchen in Mandurah I was concerned about awarding it to a Perth based company. I needn't have worried, Mike and Brian proved to be as good as their word arriving on time every time. The progress or the kitchen was so good I quickly increase the order to the whole house i.e. vanities, built in robes, laundry cupboards and specialised units in a study and theatre room.The job has turned out great. I have no hesitation recommending WA Kitchens and these guys to anyone wishing to renovate or new build their cabinetry. Brian and the team were great to deal with throughout the entire kitchen renovation. Everything happened exactly when we were told, nothing was late. The design was implemented within hours after meeting and a 3D image sent through with exactly what we had in mind (if not better).While we had to wait for our benchtop, the team made a temporary benchtop for us to be able to utilise the space (it’s the little things that really matter).WA kitchens use the best quality hardware and materials and have proficient contacts with regards to benchtops and carpentry. If you are after a kitchen done well, I would highly recommend WA Kitchens because our house is now more like a home with a stunning kitchen as the centrepiece. Fantastic experience from start to finish. Mike and Brian came up with a brilliant design from what was a drab old kitchen. I had no previous experience in design or renovations, so relied heavily on the experience of the team at WA Kitchens. First class workmanship, Mike completed all the cabinetry to the highest of standards. Also assisted in purchasing of all appliances. Would recommend to all.Thanks again Mike and Brian.Bill. Yippee, loving our new kitchen. Glenn and I are very happy with the way the guys handled all stages of the renovation, always keeping us in the loop with what is going on and when. The work was done within the stated time and we couldn't be happier with the finished product. We have no hesitations to recommend WA Kitchens to all.Can't keep me out of the kitchen now, no need for a chain here, hehe.